Nov 7, 6-7:30pm • $35, $30 museum members. It’s a pā‘ina! Enjoy live entertainment and the exhibitions Art Deco Hawai‘i, Encounters with Hawai‘i: Art in an Age of Exploration, 1778–1820 and Land Division: An Installation by Sean Connelly. A blessing will be held at 7:30pm before the screening of Nā Loea: Ancestral Ink and Nā Loea: The Great Heart of Waiokāne. Your ticket includes a Haili's Hawaiian Foods buffet featuring imu kalua pig; chicken long rice; squid lū‘au; lomi salmon; poke fish; poi; rice; sweet potato; haupia; and fresh pineapple. Wine and beer available for purchase. Directed by Kainoa Rudolfo. USA. 2014, 25 mins. Traditional kākau uhi (tattooing) is an art that was nearly lost to Hawaiians, but thanks to the perseverance of practitioners such as Hawaiian kākau artist Keone Nunes, it is enjoying resurgence in the Hawaiian community. This is the story of Nunes’ incredible journey of cultural rediscovery and his determination to learn, practice, and teach his craft. Director Kainoa Rudolpho shot this documentary primarily on the Leeward coast of Oʻahu in the Nānākuli and Waiʻanae communities, where Keone resides and practices his art of kākau uhi. Includes footage of the museum’s exhibition Tattoo Honolulu. This film is from ‘ŌiwiTV's series Nā Loea: The Masters. Directed by ‘Aina Paikai. USA. 2014.25 mins. Fulfilling a soldier’s duty to preserve life, Edward Wendt personifies servant leadership with a tenacious resolve to fight for what is right. A Vietnam War veteran and an advocate for native Hawaiian rights, he used ancestral knowledge to survive in both scenarios. 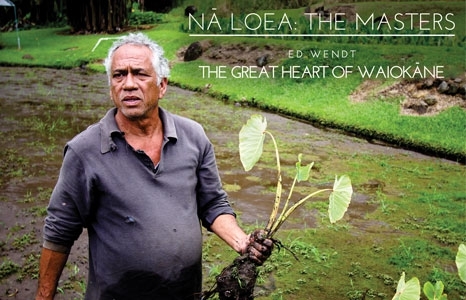 Nā Loea: The Great Heart of Waiokāne follows Ed as he continues to apply this knowledge to his current battle with sugar industry conglomerate Alexander & Baldwin, and its subsidiary East Maui Irrigation. He fights to end the century-long water diversions that drain the very life force from his ancestral lands in Wailuanui. Courage and dedication allowed Ed his day in court, resulting in the return of these life-giving waters. As development of the islands continues and the population grows, Ed sees maintaining traditional Hawaiian practices as something worth battling for.